Problem: We recently remodeled our basement and got our first real TV which was wall-mounted. However, we did not have a way to hide cords and hold our cable box and DVD player (actually it's an old Sony Playstation 3 given to me by my brother to use as a Blueray player). Parameters: I'm a graduate student with a family and need to conserve money. Secondly, I'm cheap anyhow. 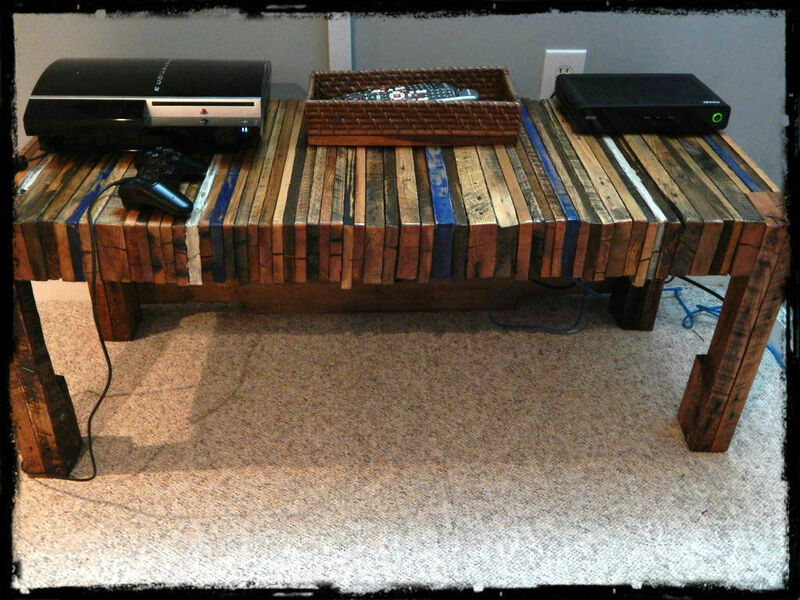 Thirdly, I really enjoy recycling and upcycling as well as the design aesthetic of using reclaimed wood. Finally, my motto is "Why buy it when you can make it?". 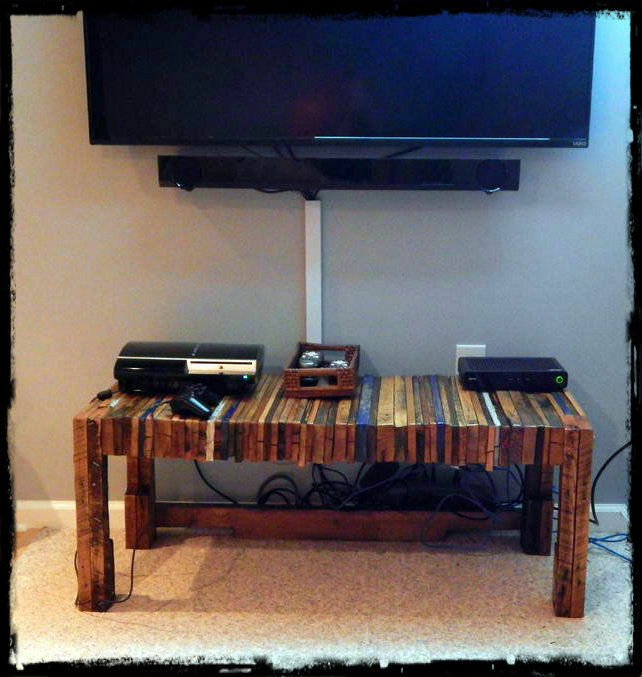 Solution: Build a reclaimed/pallet wood TV console. 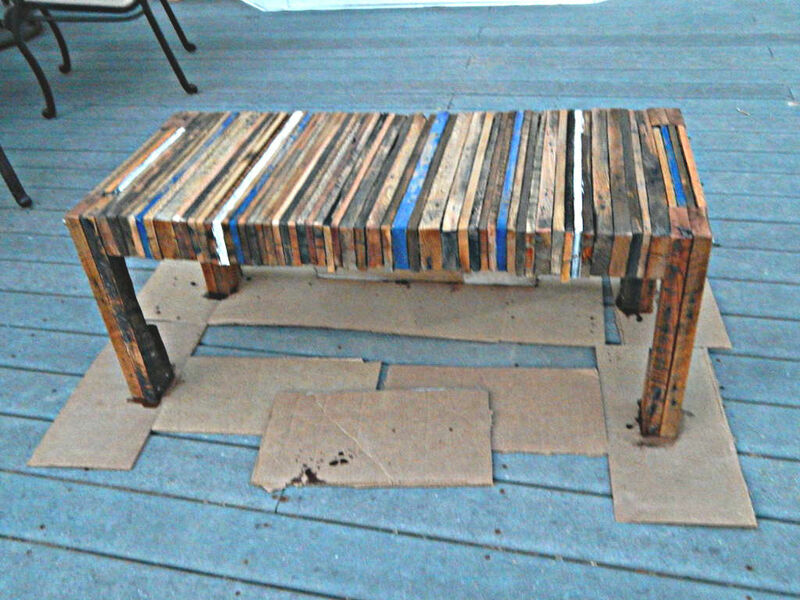 I went for a rustic, artistic looking pallet bench that turned out almost exactly like I wanted it. I hope that you enjoy my project and please let me know how your making goes! 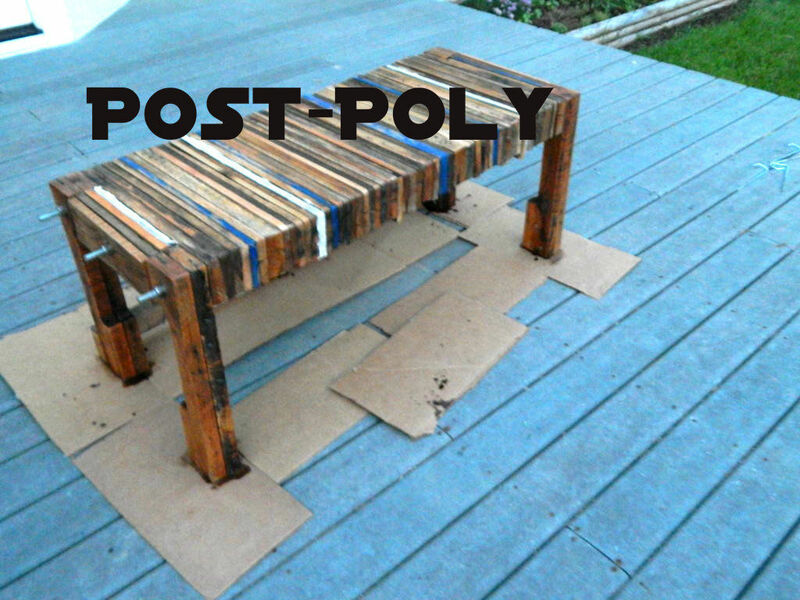 I found my initial inspiration for this work when surfing the internet for pallet tables that had been built by other makers. I found this desk on a blog by Piksl Design. I was blown away by the awesomeness of the design. I knew I wanted to make something like it for our basement. I knew that I didn't have the time, equipment, or expertise to make one exactly this nice but decided to give it a shot. I also went for a slightly less "finished" look for my table to give it what my daughter refers to as a "rustic look". I sourced my boards so that they not exactly the same lengths and didn't have a perfectly flat top. However, the effect was exactly what I was going for! After I had started this project, Instructable maker Stephhicks made this wonderful pallet table as well which I didn't take inspiration from but really like a lot! I needed about eight pallets for this particular project. I say "about" because I had some extra wood laying around from prior pallet projects that had already been torn apart and I also found some stray pieces of wood in the pallet pile that I used. Now, finding pallets is both easy and hard. • Lots of warehouses/stores have pallets just stacked up behind their buildings waiting to be taken. • Even trash pallets shouldn't be taken without asking. So, just be a good neighbor and go to the front of the building during business hours and ask. I am lucky and answered an ad on Craigslist offering free pallets and they told me to stop by whenever I want to pick through their pile. However, again, being a good neighbor I always restack the pallets even if they aren't stacked when I get there. • Instructable creator Minnecrapolis has created an ible to help aid you in your search for the safe pallet. Pallet wood, lots of pallet wood. I sourced approximately 8 pallets for this table. I used both the 1" boards and the 2x4" boards. 3 x 6' 1/2 inch threaded rods (However, if I were to do this project again, I would use 3/4" rods. Electric Planer - I would have liked to have a bit flatter top. The belt sander did a great job of getting rid of the grit, but leveling this completely needed a planer. Table Saw - to rip the boards to uniform width. However, the jaggedness at the bottom does add to the appeal. Drill Press - I did a good job keeping the holes straight and uniform but a drill press would help a lot more with this. I don't have pictures from this step. However, I'll try to explain to you how I went about this. This step is easily the hardest part about working with pallets. Also, Instructable Maker, Organikmechanic, has put together in ible explaining three ways to take pallets apart which I found helpful. 2) Use my circular saw to cut the boards away from the outer supports and then twisted the boards by hand away from the center support. This resulted in shorter boards, but in some instances was much easier. The only draw back is that sometimes this made it hard to remove the stubborn nails from the support boards. After each board was liberated from the I used my claw hammer again to tap the nails out from the boards and discarded the rusty nails. I went with a 48 inch x 18 inch table top and 26 inch legs. I then made a crude jig out of scrap 2x4's to help me to cut all of my boards to the same length with my compound miter saw. I created a jig using a representative board from my stack. I had several 2x6 boards instead of 1x6's and decided to use the nicest one to use as my jig. I then measured and marked spots for holes to be drilled. There was one hole in the very center and two that would be centered on the ends where the legs would align. I then used this representative board on the top of my jig which could accommodate one or two boards at a time to drill three holes in the boards. Because my jig was not perfect, I had to be careful to remember the alignment of the three holes. 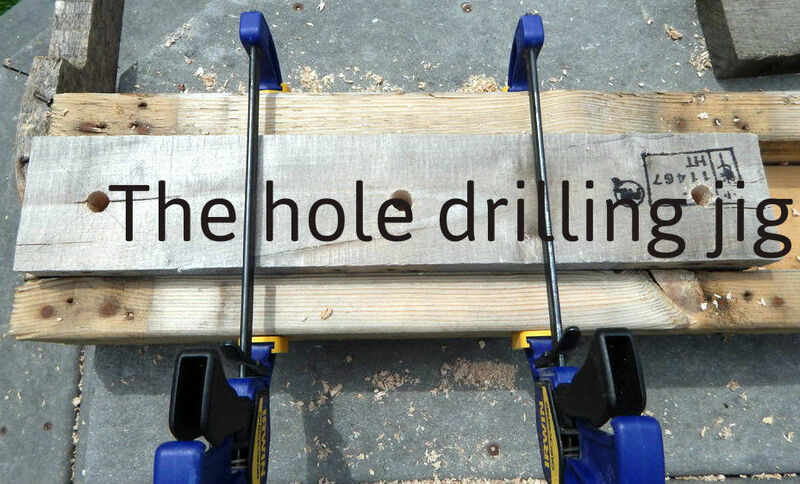 I used a hand drill with a 1/2 inch spade bit to drill the holes. The bit that I owned was about 1 foot long. In retrospect it would have been better to have a shorter one. I also drilled holes in the top of each leg to be threaded onto the rods later. I played around with the order the boards would go in by placing them on one of the threaded rods like beads on a string. I wanted it to appear random, but artistic at the same time. I probably spent too much time over thinking this. When cutting the threaded rod, I used a hack saw and my vice. When you do this, it is easy to ruining the threading on your rod so that you can't put the nuts back on. I have an easy fix for that. 4) The other two nuts will be placed on either side of your cut line. Use your hack saw to cut the rod. Remove the nuts but be careful, they'll be hot. 5) By unscrewing the three nuts remaining on your rod over the cut portion of your threaded rod, it will automatically smooth out any damage done to the threading by the saw. This takes some time and you'll need a rubber mallet, patience, and strength. Be sure to remember which side is up on your boards. I marked them ahead of time with a pencil knowing that the pencil would be sanded off. Then carefully thread each board onto all three rods. I used a back and forth tapping motion (right then left) to move the boards down. Also, I liberally applied wood glue between each board as they were loaded then used my mallet to tap them tight. You will use the tension from your nuts/rods to act as a clamp. When finished place the legs and boards onto the rods and add your washers and nuts. Tighten very tight, but not enough to crack the wood. Initially I was worried that that rods weren't supporting the table enough and I would have to start over because there was some serious sway in the table when i was done at this time. Instead, I turned the table over and waited over night for the glue to cure. Sure enough, the dried glue provided enough support for the boards after it had dried. I spent almost 4 hours sanding with a rented belt sander on the table tops, sides, and legs. I started with 60 grit paper and followed that with 100 grit. I then finished it with my palm sander and sanding block at 220 grit. The result depended by board and species of wood but overall it was silky smooth. After sanding, I brushed it down and used a tack cloth to remove saw dust and prepare it to be finished. You'll notice that on the back across the bottom, between the back two legs, there is an added brace. This is an extra 2x4 support from the pallet pile. I decided to add this because the table top was so heavy, I was afraid it would bow the table without more support between legs. It really squared up the table nicely. I did not add one to the front because I felt that it would take away from the general look that I was going for. I can always add it later. I also took the time to use three 3" wood screws per leg to attach the bottoms together. The legs had a tendency to splay apart a bit and this drew them together nicely. They were screwed through the inside to hide the hardware. Except for the painted and stained boards, I left the rest natural. I then applied two coats of Satin Polyurethane Finish. I apologize for the poor finished photo lighting, they were taken late in the evening after a day of hard work. Using a hacksaw, I finished off the rods but removing any excess rod. I then sanded off burs from the rod using a file. This isn't totally necessary but it looks nicer and you don't run the risk of getting a pair of pants or knee gouged from the exposed rod. Well, I'm finished and it looks great! I now took the time to settle back on the couch and have a well-deserved adult beverage. I hope that you liked my instructible. Please let me know if you make your own! The pallets were free and I had the tools. I did burn through one spade bit and had to buy the threaded rods. So, approximately: $6 for the spade bit, and 3x$8 for the threaded rods and bolts. I'd say it was a total of $30. Hope this helps. Hey, this is Jason from Piksl Design. GREAT job on the table! Looks really good. And I truly appreciate you linking back to my sites. Also, I just posted a follow-up article on the table I built and included a photo of your piece along with a link back to this page. Is that OK with you? Again, nice job! Thanks Jason, it's nice to get some consideration from the originator of my inspiration. Thanks for the wonderful work yourself and continue to Make things! Oh, and of course it's more than okay for you to post this. Sharing what we make is part of why we do this right? Great looking table I like it! Thanks for the advice and support Brock! "Either way, you need to seriously clean them up before you get anywhere near the inside of your house. If you can find pallets with a "HT" (heat treated) stamp on them that means they're free of bugs, but it also means the wood may have been treated with chemicals (which also means it's not great for firewood either). All modern pallets require a logo that says how it was treated, if there's no logo, don't bother with it. The nicest pallets seem to come from dry goods industries. They're usually shipping a lightweight, dry product, so there's no spillage or stains to worry about." "To be sure how a pallet was treated, look for the IPPC stamp on the side of the wood. Pallets marked with an “HT” were heated-treated and did not come into contact with chemicals during the treating process. Avoid unmarked pallets or those stamped with an “MB” for methyl bromide." Thank you Doodlecraft! This means a lot coming from you concerning the great quality of your ibles. Thanks so much for the support DC! Lovely table and nicely written 'ible. Thanks for sharing this! Very cool table nicely done! Thanks Obi, I hope your support helps! Beautiful work. The blue ones makes it look rather cool. 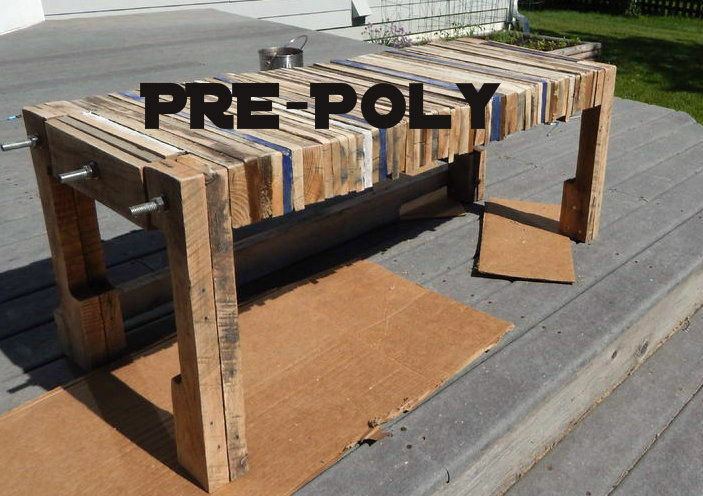 Thanks wyldestyle, this one might actually have a fence paling or two based on the wood (cedar-ish) and I think one made with flooring cast offs would be awesome. Next project!